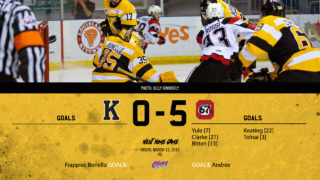 Friday night brought a potential playoff preview to Kingston when the Frontenacs hosted the Ottawa 67’s. The 67’s are in a log jam in the Eastern conference standings where just 7 points separated five teams from fourth to eighth. 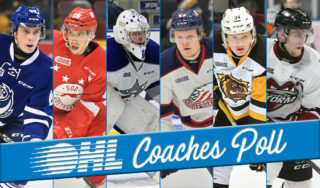 With Kingston sitting comfortably in the third spot, the possibility of Ottawa finishing sixth and setting up a first round match up was real. 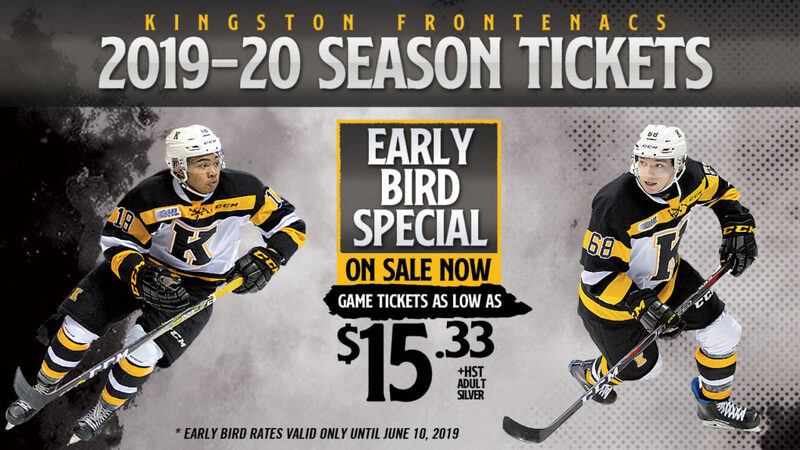 It’s a match up Kingston wouldn’t mind seeing, having won 4 of the 6 games between the two squads so far this season. 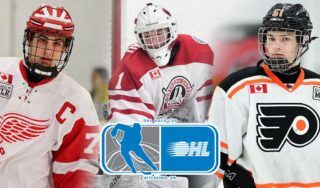 Before anything was decided playoff wise, Kingston and Ottawa would play on Friday night in Kingston, and then again on Saturday afternoon in Ottawa. Kingston was energized to start the game. They looked determined to get back to their winning ways against their division rival. It didn’t take long for them to get on the scoreboard. After Mitchell Hoelscher tripped up Gabe Vilardi, Kingston’s power play went to work. Jason Robertson made a great seam pass to Cliff Pu who had a wide-open net to tap the puck by Cedrick Andree. Kingston was up 1-0 just 2:54 into the game. 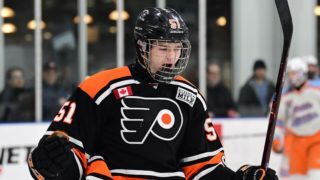 Later in the period Kingston went to the power play again, and again the power play came through. It was Cliff Pu again. He took the puck to the net and found a hole to sneak it through for the 2-0 Frontenacs lead. After the first period Kingston had doubled Ottawa on the shot clock 12-6 and lead the game 2-0. The Kingston offence kept firing on all cylinders in the second period. Linus Nyman got his 37th of the season when he tipped in a beautiful pass from Gabe Vilardi to make it 3-0 Kingston. Then Kingston got a couple of goals from some unusual suspects. Jacob Paquette beat Andree from the point with a wrist shot for his fourth of the year. That was followed by Justin Pringle’s second of the season when he one timed a Jason Robertson pass by Andree to give Kingston a 5-0 lead. Late in the period Sasha Chmelevski got Ottawa on the board, but Kingston was in full control of this one taking a 5-1 lead into intermission. Ottawa tried to make things interesting in the final frame. Graeme Clarke beat Jeremy Helvig with a beautiful shot over the glove to get the 67’s within three. Helvig played well for the remainder of the game making some big saves to kill off a couple of Kingston penalties. Ryan Cranford extended the Kingston lead back to four when he buried a pass from Tyler Burnie, who had just stepped out of the box. Matt Hotchkiss added one more Kingston goal in the final minute to make the final score 7-2 for the Frontenacs. Aside from a couple of small hiccups Kingston played a great all-around game. The penalty killing unit went 5 for 5 against a very capable Ottawa power play. 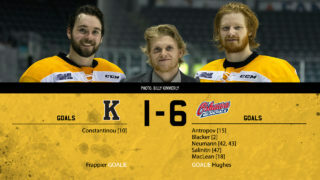 Kingston had six different goal scorers on their seven goals. The tone was set for the rematch on Saturday afternoon in Ottawa. Kingston has just the one road game this weekend tomorrow in Ottawa. They will play a rare Wednesday night home game next week when the Oshawa Generals come to Kingston. Game time for that game is 7 PM at the Rogers K-Rock Centre.